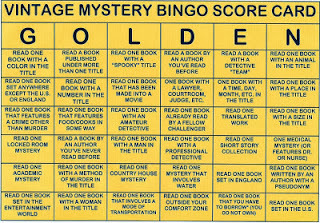 I will join the 2014 Golden Mystery Bingo Challenge. This is hosted by Bev at My Reader's Block. The rules are given below. G1 The Woman in Black by Leslie Ford. A book with a color in the title. G2 Colour Scheme by Ngaio Marsh. Read one book set anywhere except the U.S. or England. G3 The Moonstone by Wilkie Collins. 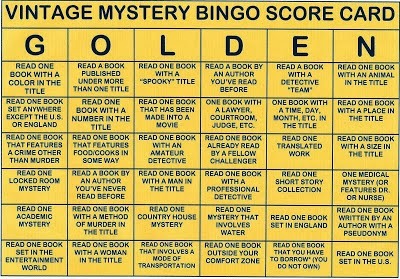 A book that features a crime other than murder. G4 The Case of the Constant Suicides by John Dickson Carr. A locked room mystery. G5 Old Hall, New Hall by Michael Innes. An academic mystery. G6 Enter a Murderer by Ngaio Marsh. A book set in the entertainment world. O1 Look to the Lady by Margery Allingham. A book published under more than one title. O2 The 9 Dark Hours by Lenore Glen Offord. A book with a number in the title. O3 Too Many Cooks by Rex Stout. A book which features food/cooks in some way. O4 Meat for Murder by Lange Lewis. A book by an author I've never read before. O5 Poison in Jest by John Dickson Carr. A book with a method of murder in the title. O6 The Vanishing of Betty Varian by Carolyn Wells. A book with a woman in the title. L1 Haunted Lady by Mary Robert Rinehart. A book with a "spooky" title. L2 The Odor of Violets by Baynard Kendrick. A book that has been made into a movie. L3 Bodies in a Bookshop by R. T. Campbell. 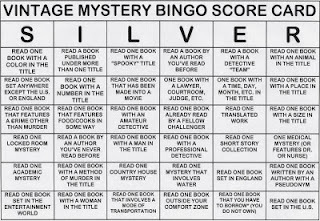 A book with an amateur detective. L4 The Case of William Smith by Patricia Wentworth. A book with a man in the title. L5 The Clue of the Judas Tree by Leslie Ford. A country house mystery. L6 The After House by Mary Roberts Rinehart. A book which involves a mode of transportation (a yacht). D1 Final Curtain by Ngaio Marsh. A book by an author that I have read before. D2 The Case of the Velvet Claws by Erle Stanley Gardner. A book with a lawyer. D3 Mr. Bazalgette's Agent by Leonard Merrick. A book which has been read by a fellow challenger. D4 One Man Show by Michael Innes. 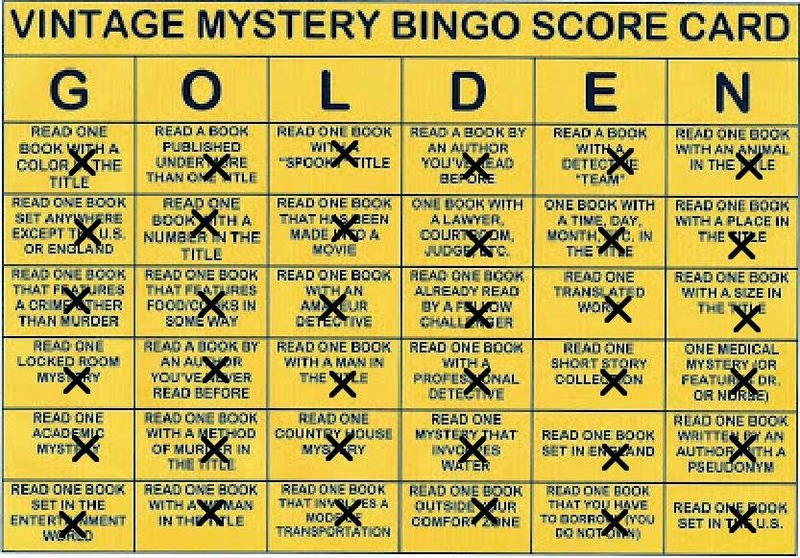 A book with a professional detective. D5 Fatal Venture by Freeman Wills Crofts. A book which involves water. D6 The Great Impersonation by E. Phillips Oppenheim. A book outside my comfort zone. E1 Death Takes a Bow by Richard and Francis Lockridge. A book with a detective team. E2 Spring Harrowing by Phoebe Atwood Taylor. A book with a time, day, month, etc. in the title. E3 Pietr the Latvian by Georges Simenon. A book that is translated. E4 The Old Man in the Corner by Baroness Orczy. A short story collection. E5 Murder Underground by Mavis Doriel Hay. A book set in England. E6 Murder is Served by Francis and Richard Lockridge. A book which I had to borrow. N1 The Murderer is a Fox by Ellery Queen. A book with an animal in the title. N2 The Lake District Murder by John Bude. A book with a place in the title. N3 The Tall House Mystery by A. E. Fielding. A book with a size in the title. N4 While the Patient Slept by Mignon G. Eberhart. A book which features a doctor or nurse. N5 There's Trouble Brewing by Nicholas Blake. A book written by an author with a pseudonym. N6 The Benson Murder Case by S. S. Van Dine. A book set in the United States. Welcome to the Vintage Mystery Challenge! I look forward to seeing what you will read.